The first time I met Fu Qiang, he was sitting in a dusty bar in South Chengdu rolling up a smoke. We shared a quick appraising glance and then I went to sit down next to him. That was more than eight years ago. Born in the 1960s, “Fu” is an old school Chengdu cat – somewhere north of 40 years old, and an encyclopedia of avant garde Chinese music and traditional Sichuan customs. There is something about his generation that gave birth to a cutting-edge type of observer that also acts as a repository of culture and etiquette that the younger kids have a hard time reproducing. Fu remembers the old days when heroin flooded the streets of second tier cities and Cui Jian was at the center of a musical revolution. In those days, before the State was able to grasp what was going on, people like Fu had access to a whole range of information and media. It was a time of unsurpassed freedom and unchained energy, the 1980’s were, and when that spirit was crushed in 1989 guys like Fu found themselves a bit adrift. Society turned away from the deeper, spiritual consequences of Opening Up and focused on material gains and national cohesion. Fu and his repository hibernated in self-imposed exile. But Fu never went away completely and neither did his philosophical peers. Their influence grew as society became more self-aware, more willing to seek out the “real things” in life. Nowadays, its en vogue to listen to music via pirate sites (back then it was pirate radio and satellite broadcasts), drink good tea and play Go. 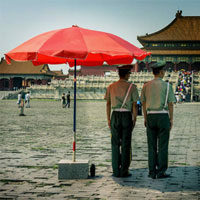 The mainstream discovered that combining traditional Han culture with modern sensibilities is the thing to do. After years of exile in Chongqing, where the chaos of that crazy city served as the backdrop for his art and music business, Fu relocated to Lijiang. The insanity of the Mountain City finally got to him and he needed a break. Chongqing really is one of those towns that never sleeps and thrives off of the jet fuel regurgitated by China’s rocket rise out of the rag heap, but that’s another essay for another time. In Lijiang, Fu as able to relax for once, take a load off, ease the pressure valve a bit and soak in the sun. The Ba-Shu region’s foggy sky had left him with a pallor and he needed some of that Yunnan altitude to re-charge his batteries. 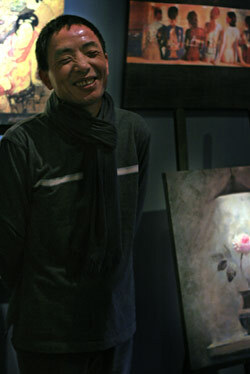 For two years, Fu sold his paintings and his music in Lijiang and finally had some of the success a man of his passion and determination deserves. You have to understand, Fu was trying to sell good music to KTVs and discos long before the likes of Panda Club showed up in Chengdu. He went through some skinny-dog days when only friends in the know would stop by his shop, drink a pot of pu’er and buy one of his mixes. In Lijiang, business was good and he also met a lady. When his energy level was up again, he decided to finally return home, to Chengdu, the city he swore he would never settle in. Every exile longs to return home, eventually. 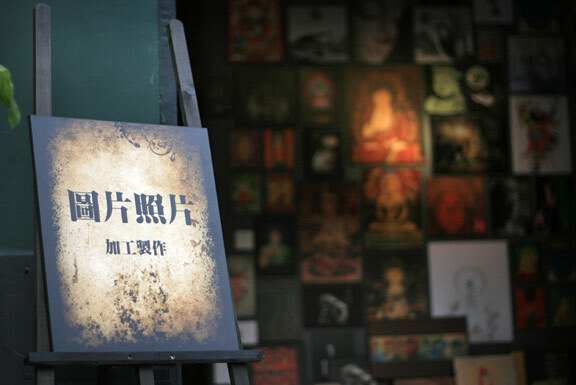 Fu Qiang’s new shop is in the old tattoo parlor next to the Little Bar on Yulin Road West (????). He sells a large assortment of paintings and mix CDs. The images he sells are actual photographs or paintings that he manipulates with software then prints out and frames. Fu has is own style and he spends most of his days tweeking an image to make it just right or customizing a picture a customer has brought in. The mixes he puts together cross all genres. He has Latin, Chinese, Burmese, old Thai, French pop, Funk and Soul and everything else you can find in the vast Internet, hidden in your friends’ hard drives and lying around your average underground CD shop selling pirated goods. Fu has a very hands off, laid-back approach to his mixes and lets the songs just blend naturally. He’s all about the music — the type of guy who will stop mid sentence, smile distractedly and tap out the tempo with his finger in the air before continuing on with the conversation. Fu is All Chengdu, serving up universal goods in his little shop in Yulin. Go check it out. Terrific piece of story telling. What’s the address of the shop so I can check it out? I know where Little Bar is but I’m not sure about the old tattoo shop. Really fantastic story telling. I fly into Chengdu tomorrow morning…heading straight to this shop after I drop off my luggage. Btw, you know if the tattooshop is any good there? Keep the stories coming…brilliant writer. I’m actually only in Chengdu for 24 hours, so I would need to plan it today and get it done tomorrow, a bit of a time crunch and I am fully aware the chances are it won’t happen. 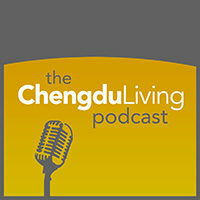 Also, you seem to be the expert on Chengdu living! Any suggestions as to where I should go to get a feel for the city in just one day? Check it out – there’s a large selection of art for sale and the prices are very reasonable.